Enhance your gameday experience or just simplify your live-and-work routine by moving your home downtown. Now you can stay close to the big game in luxury accommodations. • Renaissance Place Features Dining, Entertainment, Banking and Health Club. Hurry, only 16 condos remain! • Buy a blank slate condo by February 28, 2008 and we’ll supply $5,000 in additional upgrade allowances. 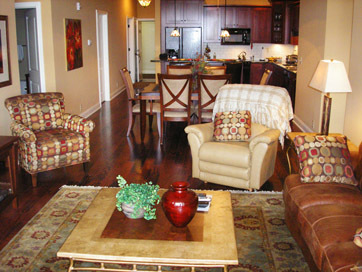 • Buy a completely furnished condo and move in today! Call Roberta Levy at 765-404-0013 or Teri Wiedman at 765-491-4629. Renaissance Place offers a rare opportunity to live in a first class building at the heart of the city center and be part of our thriving downtown. The location at the foot of the pedestrian bridge across from Riehle Plaza, is unmatched in our community and offers delightful river and city views from individual terraces. Currently, we have one beautifully furnished condo that is ready for immediate sale. Click here for to see more photos.